Photo courtesy of University of Hawai‘i at Hilo’s Marine Option Program. 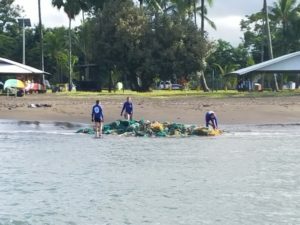 Local groups completed an effort that began in late February to remove more than 1,500 pounds of marine debris from Hilo Bay on Nov. 4. 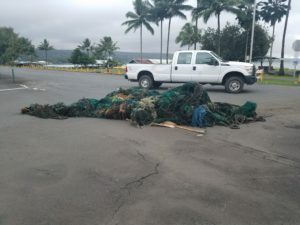 The effort began following a report received by the Hawai‘i Wildlife Fund (HWF) from faculty at the University of Hawai‘i at Hilo’s (UHH) Marine Science Department that a massive fishing net bundle had lodged itself into the Hilo breakwall. HWF worked together with biologists from the Hawai‘i Department of Land and Natural Resources (DLNR) – Division of Aquatic Resources (DAR) and UHH to attempt a removal of the bundle in late March, but only managed to free a small portion of the tangled net. Six months later, mother nature took charge when high surf broke the net bundle free of the breakwall. On the morning of Oct. 14, a dive team from the UHH Marine Option Program’s Sea Surveying, Training and Response Squad (SeaSTARS) spotted the loose net floating in Hilo Bay with assistance from members of the Kamehameha Canoe Club. A team of four MOP divers led by UHH MOP staff coordinator Matthew Connelly used a 17-foot vessel to tow the net from the end of Hilo breakwall towards Bayfront. Within 100 yards of the shoreline, the vessel anchored and three UHH students—Julia Stewart, Rosie Lee and Keelee Martin—swam the debris to shore using safety lines. 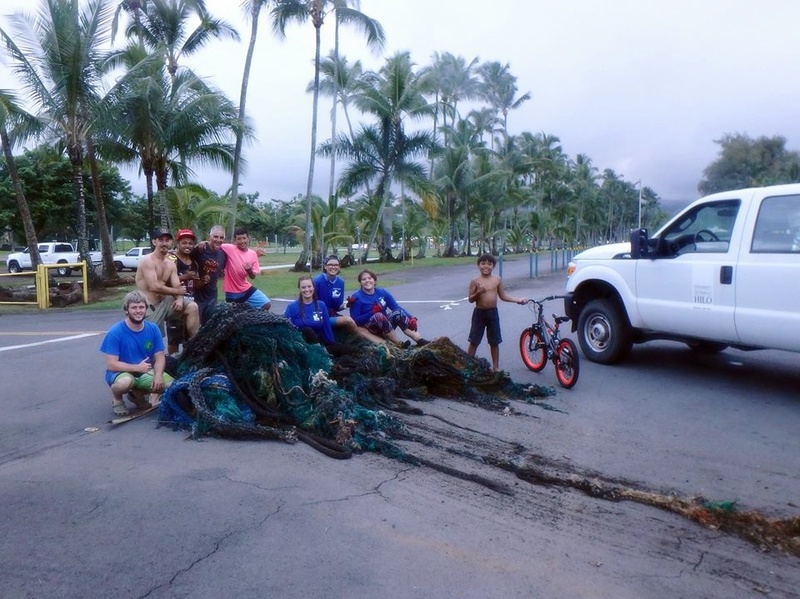 With the help of several canoe club members including Troy Parker-Bailey with the Puna Canoe Club, MOP co-coordinator Jen Sims, and two large 4WD vehicles, the team successfully hauled the massive bundle from shore to the Bayfront parking lot. 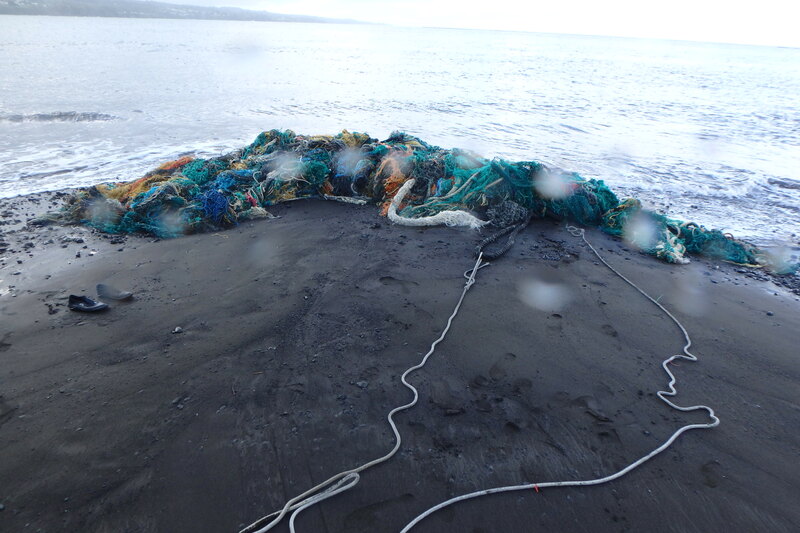 HWF staff and volunteers used a winch and pickup truck to retrieve the last remains of the net bundle on Saturday, Nov. 4, completing a nearly nine-month recovery effort. 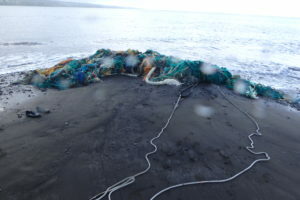 The net was hauled to the County of Hawai‘i’s Wai‘ōhinu Transfer Station where it will be stored until January 2018 when HWF arranges a 40-foot container full of nets to be shipped to O‘ahu for processing in the NOAA Nets-to-Energy Partnership with support from Matson Navigation and Schnitzer Steel. HWF is a nonprofit organization founded in 1996 to conserve native wildlife. Since it started, staff and volunteers have removed a total of 264 tons of marine debris from the shores of Hawai’i Island, Maui, Midway and the French Frigate Shoals. In 2017 alone, HWF and volunteers have removed 68,750 pounds of marine debris from Hawai’i Island and Maui through 60 community cleanup events. For more information on these conservation efforts, or to learn about volunteer opportunities with HWF, email kahakai.cleanups@gmail.com, call the Hawai‘i Island marine debris hotline at (808) 769-7629, or visit www.wildhawaii.org.